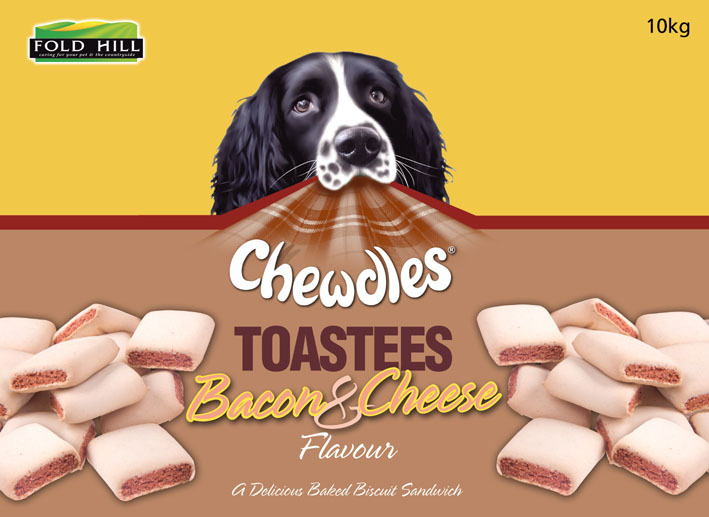 Chewdles Toasties from Fold Hill are delicious oven baked biscuits which are popular with all dog breeds. They contain added Chondroitin and Glucosamine to provide support for their joints. Cereals, Oils and Fats, Minerals (2% Calcium), Meat and Animal Derivatives, Milk and Milk Derivatives (1.2% Cheese Powder), Glucosamine (0.07%), Chondroitin (0.07%). Cereals, Meat and Animal Derivatives (4% Lamb Gravy), Oils and Fats, Various Sugars, Minerals (0.001% Sodium Hexametaphosphate, 2.1% Calcium). Colourants; Preservatives; Nutritional Additives; Vitamin A 5000 IU/kg, Vitamin D3 500IU/kg, Vitamin E 30mg/kg, Ferrous Sulphate Monohydrate 66.6mg/kg, Zinc Sulphate Monohydrate 57 mg/kg, Copper Sulphate Pentahydrate 20mg/kg, Manganous Oxide 4.83 mg/kg, Sodium Selenite 1.11mg/kg, Calcium Iodate Anhydrous 0.79mg/kg; Sensory Additives; Bacon Flavouring 50mg/kg. Colourants; Preservatives; Nutritional Additives; Vitamin A 5000 IU/kg, Vitamin D3 500IU/kg, Vitamin E 30mg/kg, Ferrous Sulphate Monohydrate 66.6mg/kg, Zinc Sulphate Monohydrate 57 mg/kg, Copper Sulphate Pentahydrate 20mg/kg, Manganous Oxide 4.83 mg/kg, Sodium Selenite 1.11mg/kg, Calcium Iodate Anhydrous 0.79mg/kg; Snesory Additives; Mint Flavouring 0.6mg/kg. Suitable for all dogs over 12 weeks of age. Feed as a snack or reward at any time between meals. To help maintain a balanced diet, adjust the amount given to keep your dog in a fit and healthy condition. There are currently no questions for Fold Hill Chewdles Toasties Dog Treats - be the first to ask one!